Gen-Tec L-Lysine is part of the new Gen-Tec Nutraceuticals range. Gen-Tec Lysine is recommended for indivuals who use Arginine supplements. L-Lysine is also commonly used as an adjunct treatment for cold sores (Herpes simplex virus). 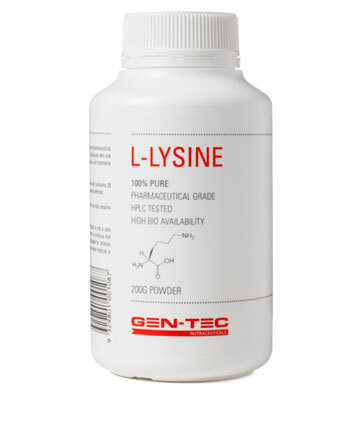 Gen-Tec L-Lysine is highly bioavailable and is HPLC tested and pharmaceutical grade. Mix 400mg (1/8 teaspoon) of L-Lysine in water and consume 20 minutes before exercise with Arginine products or individually when preferred.